BRIGHT sunshine lit up the skills on show at the Community Youth Football Festival staged by Goldsworth Park Rangers at the weekend. 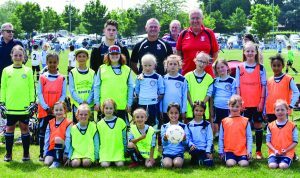 Teams in age groups from Under 6 to Under 15 gathered for a variety of cup and plate competitions, with more than 2,000 boys and girls demonstrating their footballing abilities over the two days. The festival was also keen to focus on sportsmanship during the tournament, with awards made to clubs who showed outstanding moments to highlight the importance on playing the game with respect.